Cutting its global growth forecast, the fund calls for structural reforms in major economies. Growth prospects for China and other emerging economies have been marked down in the International Monetary Fund’s latest economic scorecard, which has warned of new risks to the global recovery. 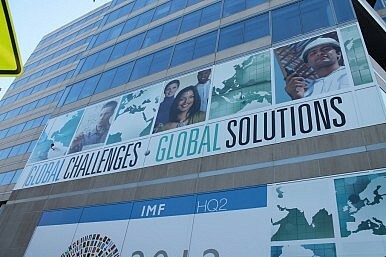 The IMF cut its global growth forecast by 0.2 percentage point over the next two years compared to its previous assessment in April. The world economy is now expected to expand at the rate of 3.1 percent this year, increasing to 3.8 percent in 2014. “Downside risks to global growth prospects still dominate: while old risks remain, new risks have emerged, including the possibility of a longer growth slowdown in emerging market economies, especially given risks of lower potential growth, slowing credit, and possibly tighter financial conditions if the anticipated unwinding of monetary policy stimulus in the United States leads to sustained capital flow reversals,” it warned. According to the fund, weak performance in emerging economies including China had reflected infrastructure bottlenecks and other capacity constraints, slower external demand, lower commodity prices, financial stability concerns and weaker policy support. China is expected to expand by 7.8 percent in 2013 and 7.7 percent the following year, which while higher than many market economists’ forecasts, is still lower than the IMF’s previous projection. India is seen posting 5.6 percent growth this year and 6.3 percent in 2014, with growth in the emerging economies forecast at an average 5 percent this year and 5.4 percent in 2014, down 0.3 percentage points since the April outlook. According to the IMF, the emerging economies have been hit hardest by financial market volatility, with increases in advanced economy interest rates combined with weaker domestic activity leading to capital outflows, equity price falls, rising local yields and currency depreciation. Slower than expected growth in the second half of 2012 had also been affected by the eurozone’s deepening recession, which is expected to continue until 2014. Fiscal contraction had weighed on improving private demand in the U.S. economy, which is seen strengthening in 2014 to 2.75 percent growth. Commenting on the forecasts, Australia’s federal treasurer Chris Bowen said the Asia-Pacific region would still underpin global growth, but Australia would not escape any global downturn. “Australia is not immune from global economic and financial uncertainty. This underlines the need for responsible settings and policies to help manage the transition underway in our economy, and to support productivity, jobs and growth in the face of ongoing global economic weakness,” Bowen said in a statement. The IMF urged policymakers to take stronger action over global growth, with key advanced economies needing to pick up the slack while still ensuring “credible plans for medium-term public debt sustainability” – a message perhaps addressed toward Japan’s finance ministry. “With low inflation and sizable economic slack, monetary policy stimulus should continue until the recovery is well established,” the IMF said, clearly targeting the US Federal Reserve’s so-called “tapering” of its monetary stimulus. For the emerging economies, the fund warned of “less fiscal policy space than previously estimated” with monetary easing the first line of defense. “However, real policy rates are low already, and capital outflows and price effects from exchange rate depreciation may also constrain further easing. With weaker growth prospects and potential legacy problems from a prolonged period of rapid credit growth, the policy framework must be ready to handle possible increases in financial stability risks,” it said. Similar to calls in Japan, the IMF said all major economies needed to support growth through structural reforms to support global rebalancing. “As before, this implies measures to sustainably raise consumption (China) and investment (Germany) in surplus economies, as well as measures that improve competitiveness in deficit economies,” it said. Can Asia carry the weight of the global economic recovery, amid a softer eurozone and slow US pickup? For Asia and the IMF, it’s a question of more than academic interest as the region keeps a wary eye on policymakers in Washington and Beijing.